The Indo-Tibetan Border Police(ITBP) band gave a musical performance at the Siri Fort auditorium in New Delhi yesterday. This was the first such concert by the ITBP band. Minister of Home (State) Kiren Rijuju was the chief guest for the evening. Led by conductor Major Nazir Hussain VSM, the band entertained those present with a whole range of musical numbers. From patriotic songs to old Hindi film songs and some western tunes, all in all 16 tunes of martial music were presented by the Band. Greeting the band after the concert Kiren Rijuju said "he had had a very busy day today, but after attending the concert he said that he is feeling refreshed again". He further said that he felt very happy and proud to be part of this concert and added that such ITBP concerts should be taken to other parts of the country. 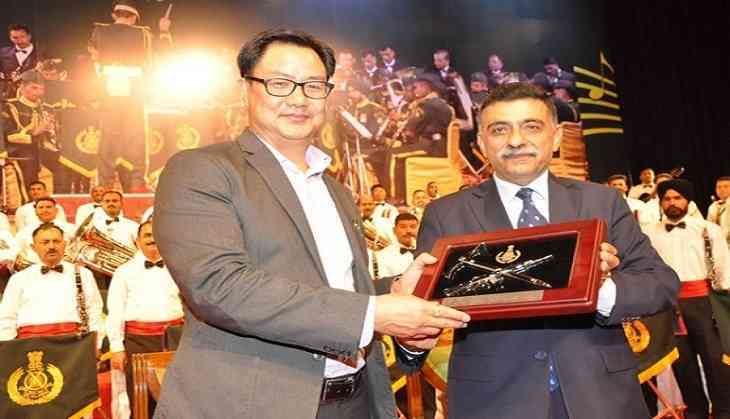 The Minister complimented the band for the rendition of the patriotic song "Hum Sarhad ke Sainani", which he said showed the love and commitment of the ITBP jawans for their motherland. "He further added that all the different Central Police Forces should organise such concerts around the country". He concluded by greeting the ITBP Director General RK Pachanada for winning the trophy for 'best marching contingent' at this years' Republic Day parade.